Dryfast Foam is the Perfect Material for Durable Outdoor Cushions – Foam Factory, Inc. Foam possesses many different variances, from cell type, to strength, density, size, shape and color. And like people, there are some types of foam that are more widely known than others. Soft and squishy polyurethane foam is like society’s movie stars and strong closed-cell polyethylene is like popular athletes; recognized by almost every one. But just as important in society are the less-recognized individuals who do the jobs that make everything else possible, like builders, doctors and researchers. So while it doesn’t receive the recognition or fame of some materials, Foam Factory, Inc.’s Dryfast foam is one foam variety that does its job and does it well. Dryfast is particularly unique in the world of foam. Classified as an open-cell foam, it is the most porous material of all the open-cell varieties. If you took a block of traditional polyurethane sheet foam, set it a couple feet away and looked at it, you wouldn’t be able to see any of the tiny bubbles or cells that make up the material’s structure. With Dryfast foam, the almost-fibrous structure is evident even from a distance. Cells on traditional open-cell foam products are often barely a fraction of a millimeter in diameter, where a single cell in Dryfast foam can be two, three, four or even five millimeters large. And like traditional foam materials, different formulations of this reticulated foam can be designed to have cells smaller or larger than that. The process that creates reticulated Dryfast outdoor foam is one of the most unique in the polyurethane industry. The material starts in its original form like any other material, with cells walls forming the panes in what is most often a 12-sided geometric figure. At this point, one of two processes is applied to the material to create its uniquely wide-open structure. In one, a chemical process is used, also known as quenching. In this method, the foam passes through a caustic fluid at pre-determined and monitored levels of strength, temperature and immersion duration. The material is in the compound long enough for it to eat away the cell walls, also called windows, leaving the main structure behind, called struts. The material is then rinsed and dried. The other method is the thermal process, known as zapping. Placed in a vacuum-sealed container, it is pumped with a mixture of explosive gasses. An ignition source is produced, and by virtue of being in the vacuum-sealed environment, there is a controlled and quickly moving flame that goes through the foam form which melts the ultra-thin windows but leaves the struts intact. These two methods produce similar results with a couple different traits unique to each process. The quenching method leaves behind some cell wall remnants for a more jagged finish, which can retain more water and debris due to the increased material volume. The zapping method produces cleaner struts in the fast-drying foam that are essentially melted smooth for a shinier appearance and greater ease of movement for fluid and air through the material. 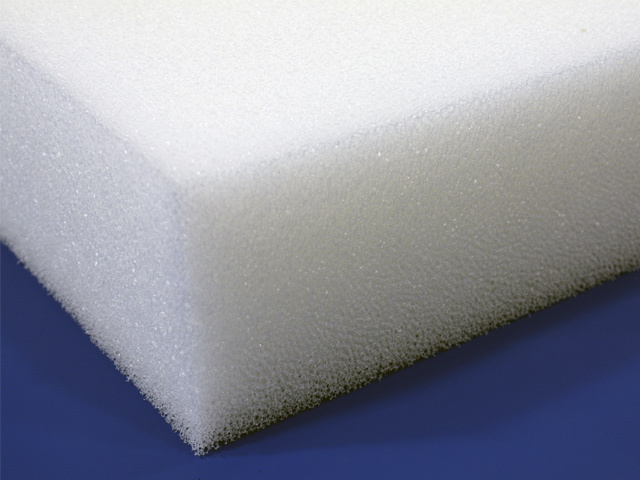 Foam Factory’s Dryfast foams were manufactured using the zapping process, which is evident by looking at the material, with its clean struts and smoother appearance. While reticulated foam can be used for many purposes, like air filtration and fuel line filters, it can also be used like its more conventional foam relatives as comfort and support products. The appearance, texture and porosity of Foam Factory’s Dryfast foam makes it an excellent material for outdoor chair cushions like a patio seat or pool furniture, as well as marine foam uses for a boat cushion or sun pad. 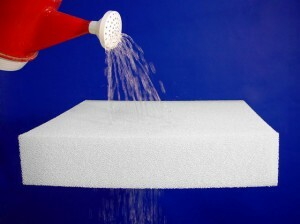 Traditional foam materials are frequently referred to as spongy, and this is true for both feel and performance, as foam cells can hold large amounts of water. This isn’t a positive thing though, as retained moisture can hasten the degradation of a foam material through mold, mildew and bacteria growth. This is why many boaters end up with waterlogged, rotten cushions and patio seats can be ruined by forgetting the cushions outside during a rainstorm. Dryfast foam is a solution to these issues. With its wide cellular structure, water can easily pass through the material, as can air, which makes for a cushioning and comfortable material that does not easily retain water, with what water is held evaporating through the free flow of air through the structure. Foam Factory’s Dryfast foam is also unique in that it has been treated to be antimicrobial. This is important, because while the material is designed to easily dry, there are many situations where this may be affected by externalities. For instance, wet towels may be left on a cushion after getting out of the pool, or it can be left on a surface where there is no chance for moisture to evaporate from underneath. In these situations, the antimicrobial formulation will resist the growth of irritants that negatively impact you and can ruin your custom cushions or even your boat mattress if moisture makes its way there. Having this material also means you will have cleaner cushions as well. When used outside, traditional foam can trap and hold dirt, dust, pollen and other particles, even when kept completely dry. Once these very tiny particles get inside a foam form, they are very difficult to get out. But with Dryfast foam, if you begin to notice dust or debris in your cushion, you can easily clean it. Either remove it from its covering or ensure that it is encased in water resistant, breathable outdoor fabric like Phifertex or Sunbrella, and give the cushion a good rinse with a hose. The pressure and quantity of the water can force out particles that rain cannot, in addition to likely being cleaner water. When done rinsing, place the cushion outside or inside in a well-ventilated area. Since drying should not take more than a day at most, there should be no concern over placing it in the sun to expedite drying outdoors. Aiming a fan at the material if being dried indoors will also help speed the process. These qualities make it perfect for wicker chair cushions as well as a settee cushion. The next time you need foam for a job, keep in mind that just like us, every type of foam is different. Because of this variety, there are very few tasks that at least one foam material isn’t made to excel in. So, if you need a foam that can stand up to long-term use as a cushion or need a foam for use in a wet, marine or outdoor environment, you won’t have to compromise, thanks to Foam Factory’s Dryfast foam.